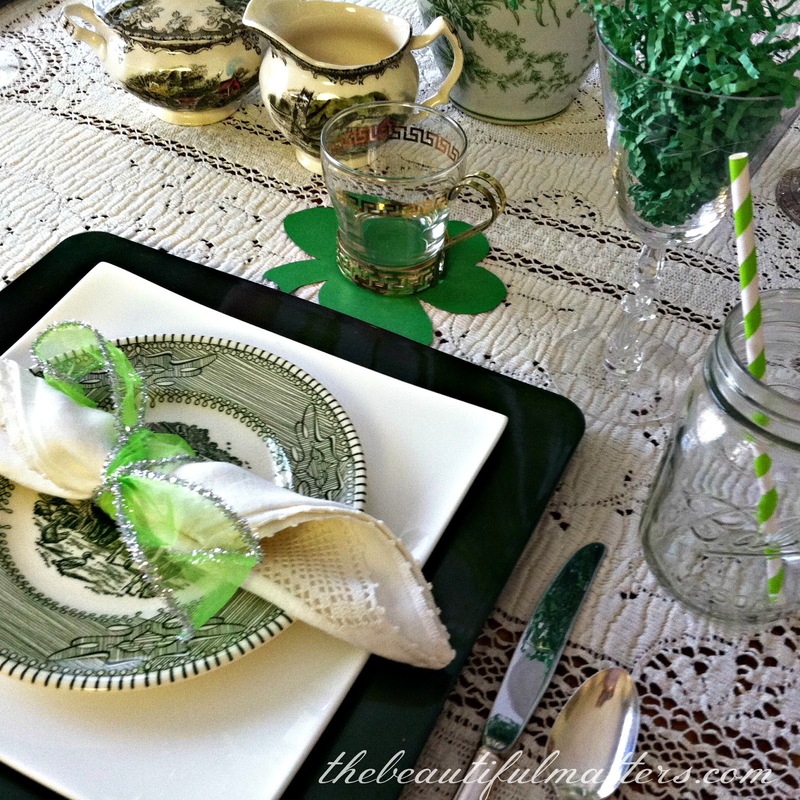 Today I have a green tablescape, some Irish poetry, and a little fashion tackiness to share, all in honor of St. Patrick. A couple of years ago, our book club read How the Irish Saved Civilization, by Thomas Cahill, and it really helped me to appreciate more the contributions of the Irish to the world. St. Patrick, of course, brought Christianity to Ireland, but what I didn't know was how all the important documents and texts of the civilized world were safeguarded in Ireland as Rome fell and the western world descended into chaos and darkness in the fifth century. Monks and scholars in Ireland preserved and copied our written texts, and then sent out missionaries to spread light and learning throughout Europe during the early Middle Ages. We owe quite a debt to those early Irish. After a traditional American-Irish dinner of corned beef and cabbage and Irish soda bread, we'll have a little Irish coffee. These darling little mugs came from my mother-in-law. Faced with an enormous amount of stuff to sort through after she passed, I almost let these go. So glad I held onto them. Fresh cream to whip is the best, but in a pinch, these shelf-stable boxes of whipping cream from Trader Joe's work quite nicely. They can always be on hand, ready for a quick treat. We have some single-serving coffees from our local grocer, in Irish Cream and Chocolate Mint flavors. 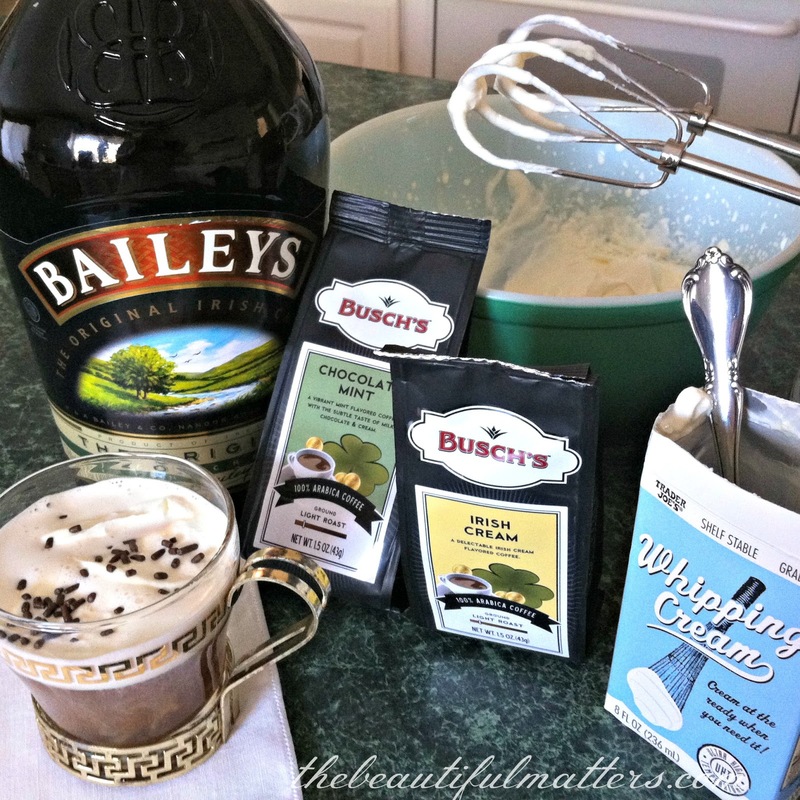 A little bit of Bailey's if you like and some chocolate sprinkles, and there you go. The Irish are known for songs, poetry, and literature. Here is a lovely poem from an Irish poet of the 20th century. This poem reminds me of another little poem by an Irish poet about hearth and home. I love this little gem. The ticking clock and shining delph! This is so poignant. And it sure makes me feel thankful to have a floor and a hearth to sweep, and dishes to arrange and display. I love all things beautiful and elegant and lovely. But sometimes a little tackiness is just too much fun to miss. 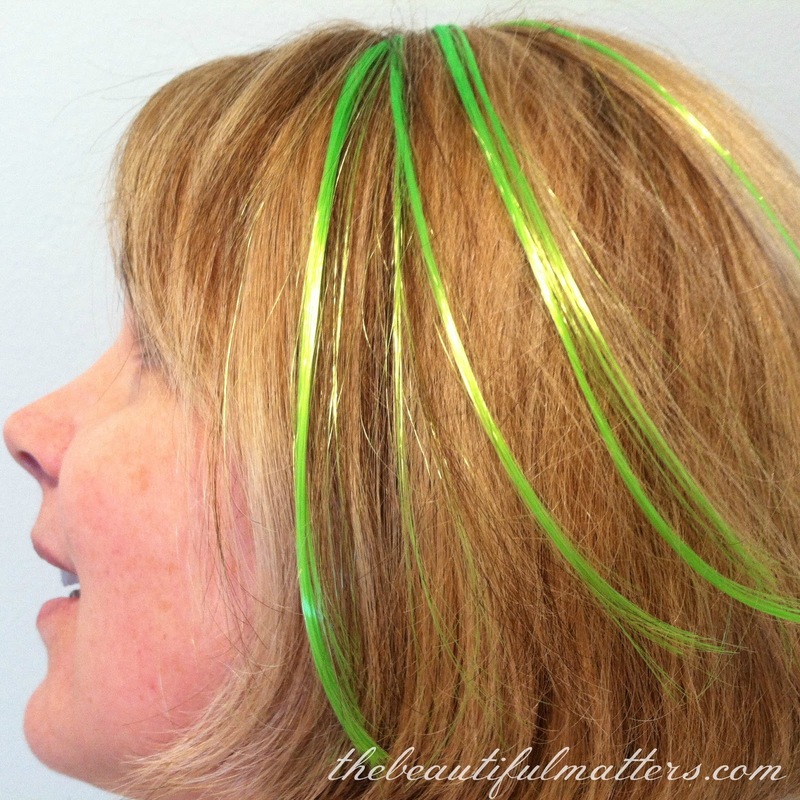 Here I am, sporting a little o' the green, with a little green hair extension sourced on the cheap at the local Walgreen's. Erin go Bragh! 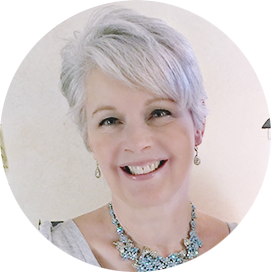 Don't forget to enter my ***GIVEAWAY*** here before March 17. This is so pretty and I love the poems you shared of Yeats. I had not seen the second poem before. I knew that about that Irish, not because I read that book, but because I took an Art history course. Your table is elegantly festive. Beautiful lace tablecloth. I'm also located in Michigan... Midland. Happy St. Patrick's Day! What a beautiful lace tablecloth!! Your place settings look fabulous against it. It looks like you will be having some good fun on St. Patrick's Day! This is a wonderful Irish tableau! 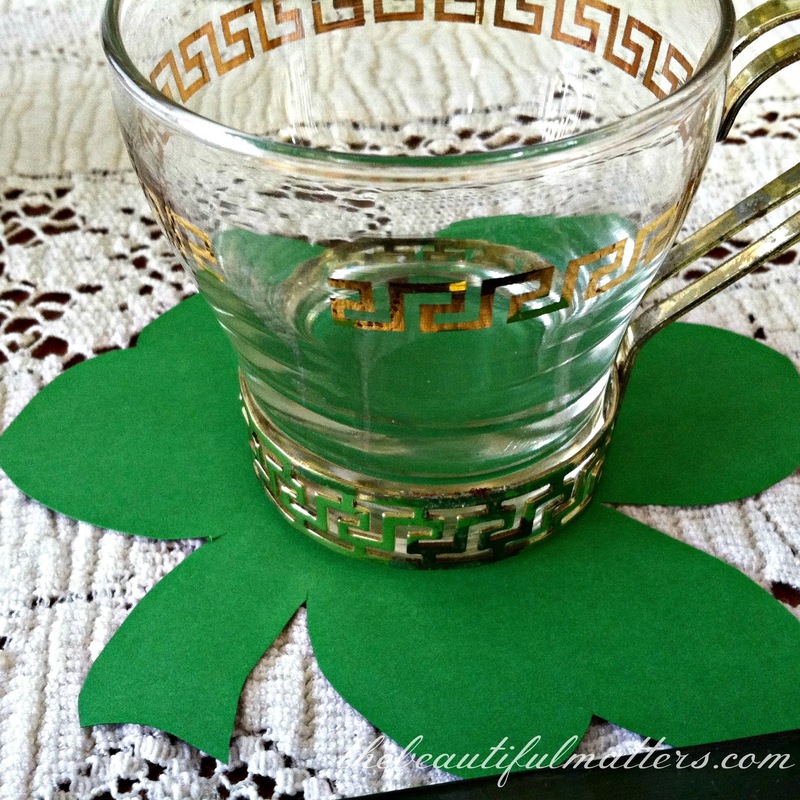 I love the green accents in the vase and the ribbon and the shamrock coasters. Those glasses are terrific. I really enjoyed reading the poems, especially Yeats...a wonderful ending to your Irish dinner to accompany the Irish coffee. You should definitely try your local tea place (jumping to the comment you left on my blog--thanks by the way!). I had one near me that just closed in December. I loved walking in and seeing the different blends; she was always getting new blends in many of them seasonal. What a great table...love your napkin rings! 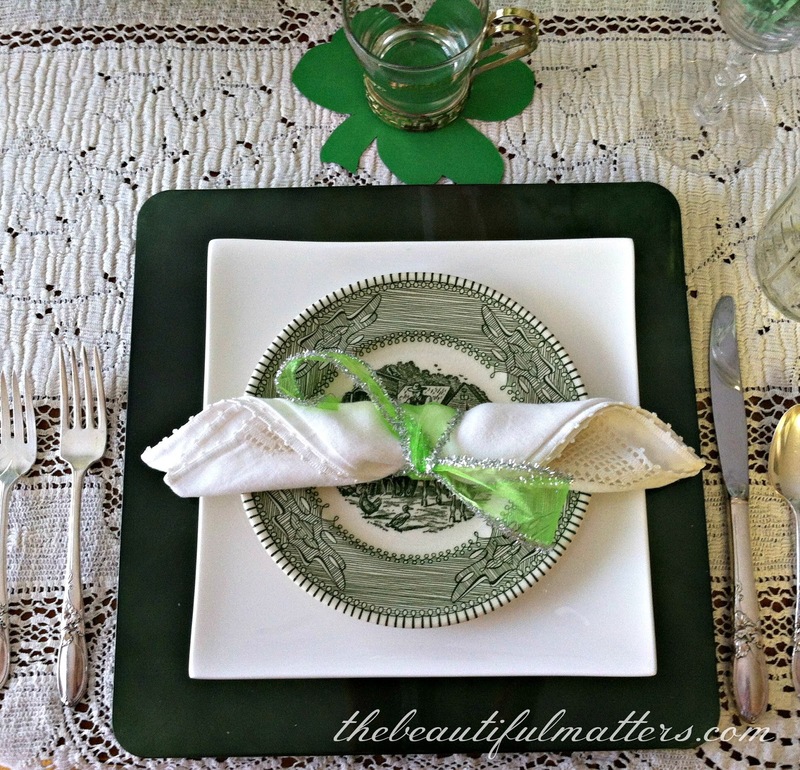 Wow, what a gorgeous table setting for St. Pat's! 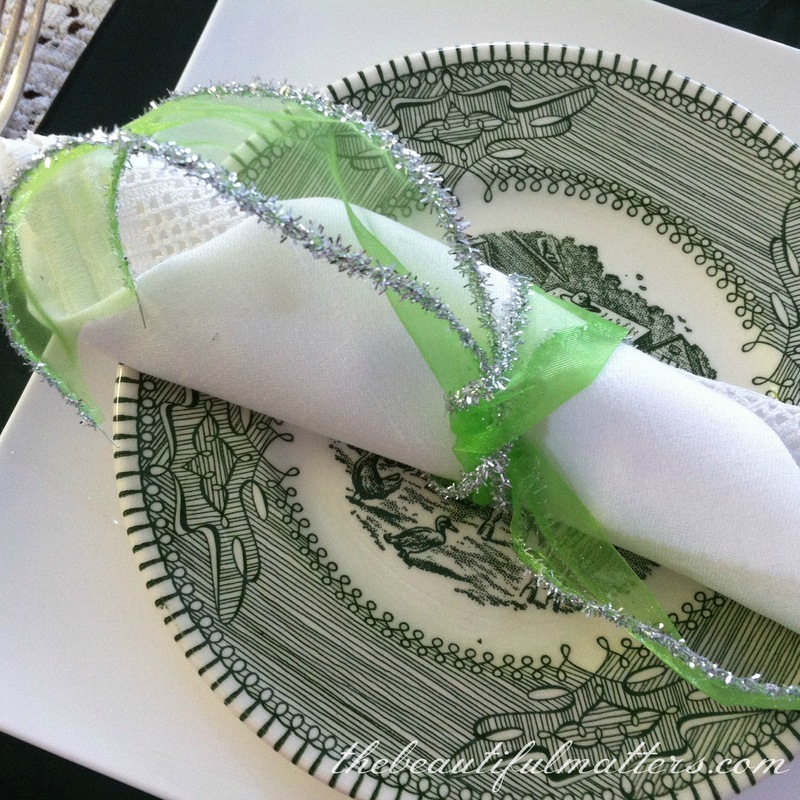 I love the Green transferware dishes and the napkins with your ribbin rings is awesome! The glass cups are awesome! Now, your lace tablecloth is swoonnnn!!!! Thanks for popping in to visit me sweet friend. My grands left today, I miss them already! I love the tacky green hair adornment and the poems struck a chord in my heart. Beautiful table-setting. Beautiful table, Deborah. 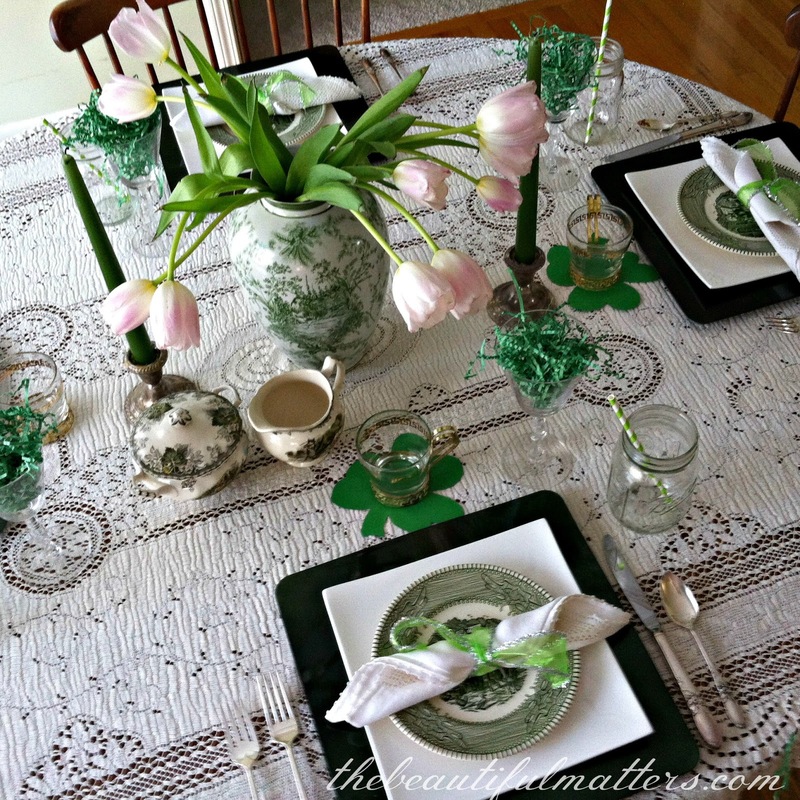 Loving all the green this week...and that vase holding the pretty pink tulips is just gorgeous! 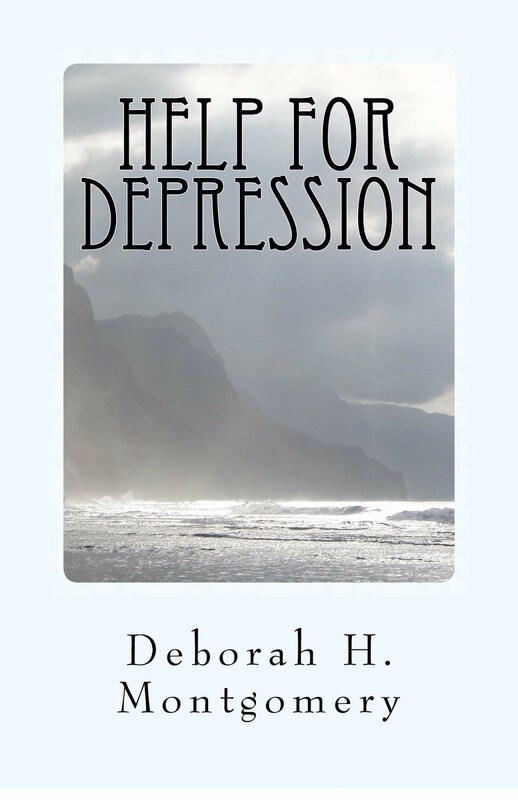 Dear Deborah, thank you for your kind visit and comment at Thistle Cove Farm; I followed you home. The poems are beautiful and love them both. May I have permission to use the Woman poem at some time? In November I was in Ireland for two weeks and visited Trinity College and the Book of Kells. God has blessed me wonderfully...I've visited the Magna Carta, the Gutenberg Bible and now, the Book of Kells. BTW, St. Patrick's Breastplate is my offering for St. Patrick's Day. This is a great post! I love the poems, especially the last one. It does remind us to be thankful for our blessings. Lovely table, too. Sounds like you'll have a great St. Patty's Day! We're just having Reuben sandwiches this evening. Can't do all that corned beef and cabbage. We'd have to eat it for days afterward!! Enjoy! What a wonderful time you had! Love the touch of green in your hair. We had plans for a green family dinner and cancelled because of too much sickness going on. Boo-hoo! Next year, I guess. Thanks for sharing with SYC.